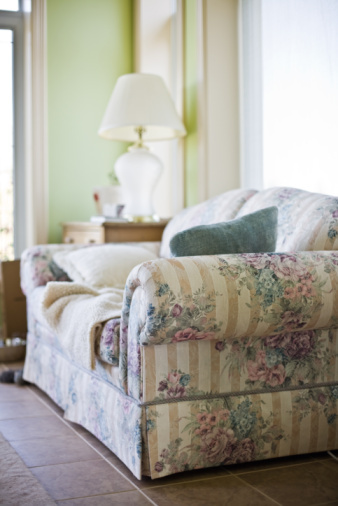 Sofa arms are susceptible to dirt, spills and getting worn. Making protective covers for them can give your sofa some extra time before you either want to replace it or reupholster the entire piece. What's great about making your own is you can get extra material and make matching pillows. That way it will look like the arm covers came with the sofa. This project should take about an hour to complete. This article will explain how to make sofa arm protective covers. Measure the arm of the couch from the back cushion to the end of the arm. Measure from the seat cushion to the same place on the outer side of the arm. Add 1 inch to each measurement for sewing seams and hems. This is your first piece. Measure the widest part of the front of the arm and the length from the top of the arm to the seat cushion. If the front of the arm is rounded, you can trace the rounded front section on a piece of brown wrapping paper, add 1/2 inch for the seam and use it as a template. Cut two of each piece from your fabric. Sew a 1/2-inch hem along the back edge of the first piece. On the front edge, sew on the second piece top edge with right sides of the fabric together. Use a 1/2-inch seam. If using a rounded edge front piece, it may be easier if you pin the pieces together before sewing. Sew a 1/2-inch hem around the bottom of the arm protector and repeat for the other arm. Slip over the arm of your sofa and you're done.